My sister and her friend share the same birthday (July 6) they are an hour apart I believe. 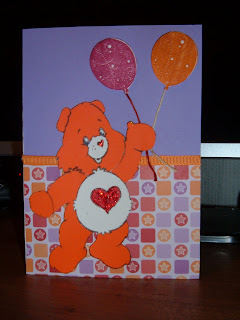 Kay's friend likes Carebears and her favorite is Love A lot Bear (the orange care bear) so I made her this card. At first I had the carebear on a different card backing and then I was going through my paper for a different card and came across the pattern paper (from DCWV EveryDay paper pack) and I changed it. The care bear is a coloring sheet that I printed from the web and I shrunk it down to fit my card. I stickled (I love stickles I just want to stickle everything) the nose and heart on the tummy. Wow! That turned out so cute. I'll have to check out "stickle." I am so far behind in the embellishment department! Very cute Chrissy. My kids used to love the Care Bears too! Your Care Bear card is so cute. My granddaughter loves them. I will have to remember this for her birthday. cute.. I remember care bears.. Thanks so much for sharing. That is such a cute card. Like you I'm a stickles nut! It's gotten to the point where some of my friends say, "What no sticles? Are you feeling OK? I find it wonderful that they brought out the Care Bears full force again so that another generation can learn to love them! Awww.......that is sooo cute!!! And really takes me back to the 80's!!! My little sister loved them too!! What a wonderful idea to use colouring in sheets. Carries gonna like the card!